The latest gastronomic experience in the locality. 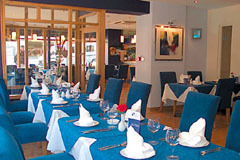 Le Bien Manger offers fine French cuisine and a range of Mediterranean dishes, complemented by a good range of French and New World wines. This modern, bright restaurant has a very comfortable bar area with leather sofas in which to enjoy a pre-prandial drink or a coffee and brandy. As a party venue it is the ideal location, being right in the centre of Croydon and with a private function or party room. The standard of service is worthy of the West End being both professional and friendly. Open every day noon-11pm. All major credit cards accepted. Sunday brunch served from 11am-5pm.